On Sunday, Fox aired the latest of the live TV musicals, “Rent Live.” However, when star Brennin Hunt broke his ankle less than 24 hours before the live show, the theatre motto, “the show must go on,” was put to the test. Producers and cast members quickly worked together to alter costumes, staging, and editing to ensure the show would indeed go on. This included airing a pre-recorded version of the show (except for the finale) in place of live broadcasting of the show. This is not the first time that a production of Rent has faced a tribulation. Almost exactly 23 years ago, creator and composer, Jonathan Larson tragically died the night before his six year project “Rent” opened off-Broadway for previews. The cast went on to perform Larson’s creation, dedicating the show to his memory. Rent continued to embody the spirit of love and strength with overwhelming support for Hunt during his injury. Fox’s “Rent Live” was beautifully adapted to accommodate the family friendly broadcasting station and did not lose one bit of depth to the story and power. The high energy musical opened with the touching words of Jonathan Larson on screen before Jordan Fisher and Brennin Hunt kicked off the show with the rock opening, Rent. The monochromatic set embodied the 1990s New York cityscape perfectly, and the electric energy of the lighting design engaged audience members in the studio and at home. Vanessa Hudgens did not hold back in her full-send performance as the eccentric Maureen. Her stunning vocals and powerful stage presence overflowed the studio with her charismatic energy and charm. Jordan Fisher was the perfect Mark in simplest terms. His acting was on point and he really tapped into the the essence of Mark. Jordan Fisher also made history, as the first person of color to play Mark, and he sure did live up to the feat. The show’s first act had many high moments but there were also a few low moments, when the pace and energy of the show seemed to drag. There were also instances in which the mood of the show seemed to become more of a concert than a musical. When Jordan Fisher and Brennin Hunt crowd surfed during “What You Own,” and the studio audience screamed like teenagers at a One Direction concert, the purpose of an enthusiastic audience digressed from an engaging experience and became quite distracting. However for most of Act 2, the emotion and passion that the actors put into their performances had me hooked, and I could not even look away for a second to take note of the brilliance that I was witnessing. Brandon Victor Dixon’s heart wrenching rendition of “I’ll Cover You (Reprise)” had teens and adults alike in tears. His character truly reflected the timeless message of love that Rent continues to share in a time when we need it most. The show closed with one live broadcasted scene, “Finale B”. Between Brennin Hunt performing his heart out with his foot bandaged up in a boot, and the cast coming together for one last beautiful number, the finale left my mouth gaping in awe of the masterpiece that I witnessed. It’s not how many years you live but how you fulfill the time you spend here. As if the audience’s hearts were not already melted, the original Broadway cast walked onstage to perform the famous “Seasons of Love” with the cast of “Rent Live.” Seeing Vanessa Hudgens belting out with Idina Menzel, and Anthony Rapp with Jordan Fisher was truly a sight to remember. 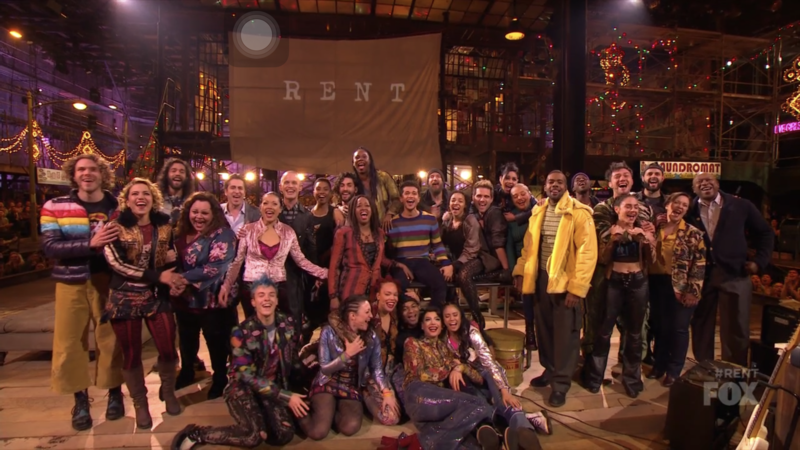 Fox’s “Rent Live” was executed beautifully in spite of setbacks and criticism. Rent tells a story that is so poignant yet still so raw and emotional. To see Jonathan Larson’s message of what is means to be alive and in love, realized on stage, was inspiring and filled me with hope for my generation and this world.